Many cakes feature designs that are piped on with butter cream frosting. This is a painstaking process, but can give any number of totally unique looks for your cake. For instance, you can have your wedding cake resemble the lace on your wedding dress by having your baker pipe butter cream icing onto the cake in the same design of the lace on your dress. It may be necessary to provide your baker with a sample of the lace, but the results will be amazing. You will have a totally unique and custom cake that is nothing at all like any other wedding cake. 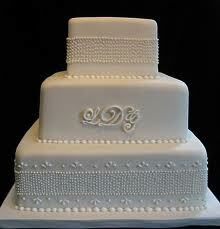 Another idea is to use piped frosting to have your cake "monogrammed." Your baker could either choose a single spot on the cake for a large monogram or place small monograms in strategic locations all over your cake. Of course, the choice is completely up to the bridal couple. Many couples will choose to use fresh flowers on their wedding cakes. The baker will generally incorporate flowers that will be used in the wedding - either in the bouquet, the centerpieces or as other decorations. Sometimes the flowers are only placed on top as a wedding cake topper and other cakes will have the flowers cascading down the sides of the cake. The possibilities are endless when it comes to decorating wedding cakes with fresh flowers. If you wish to keep your cake completely edible yet still have the look of fresh flowers, you can always have your cake decorated with sugar flowers. A good pastry chef can make sugar flowers that look almost exactly like the real thing. You almost have to take them off and eat them to know the difference. No matter what design you choose, be sure to think it through completely and then make the cake your own. Let it reflect your style and personality as a couple.